This entry was posted in I Ching Calendar 2017, news by Stichting Akhaldan. Bookmark the permalink. 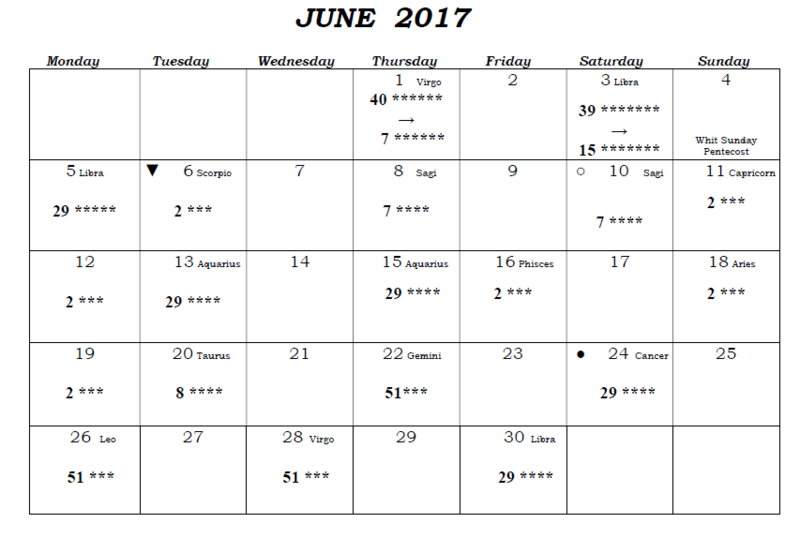 As you can see in June 2017, we go from 7 stars ( Whit Sunday) to 3 stars Tuesday the 6th of June. As you can see from the Tree of Life, where the amount of stars is eplained via the 7 chakra’s! So from “Enlightenment” to the heart chakra = emotional area. That is a big change as you can also see in the change of weather in whole Europe. Good I Ching books are: The I Ching by Christopher Markert; The I Ching by Richard Wilhelm and the I Ching by Norbert A. Eichler especially in German, Das Buch der Wirklichkeit, das I Ging des kosmischen Zeitalters, because of the great poetic language, like Goethe!